Enroll in the UB Professional MBA program and invest in your future. After earning a degree from the most respected business school in Western New York, you’ll be poised for career opportunities you’ve never imagined. Read more. The UB Professional MBA program is for working professionals who are looking for convenience and flexibility from a nationally ranked business school. Strengthen your leadership skills, learn the importance of team dynamics and immediately apply your knowledge in the workplace. Read more. Experience the Professional MBA for yourself. Talk with faculty and staff at an information session, or experience life as a student by attending a class with one of our student ambassadors. Read more. Take your career in a new direction. Join the school with a worldwide reputation for producing highly skilled business leaders. Enroll in the Professional MBA program today. Read more. If you have a bachelor's degree and at least one year of full-time professional work experience, you may be eligible to take non-matriculated courses in the spring semester. Read more. If you’re an incoming Professional MBA student or a current PMBA, you can access all of the administrative tools you need. Read more. Are you looking to advance your career but don't think you have the time? 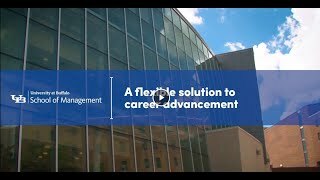 Work and life can get busy, but the University at Buffalo Professional MBA program offers a hybrid part-time MBA program, designed for busy working professionals.